Tropical depression 11 E has formed. Jova possibly will affect the west coast of Mexico near Cabo Corrientes early next week. I will start updates if it looks like significant affects will be felt on the coast coastal areas. I will start updates later today or tomorrow morning on Jova. Jova will likely impact the western coast of Mexico roughly near Manzanillo overnight Monday night. Residents and tourists should follow the progress of Jova and take appropriate action. Jova is slowly strengthening as a minimal hurricane. Rainbands are forming farther to the east and some will likely affect the west coast of Mexico by later today. Conditions will slowly deteriorate late tomorrow and rapidly Tuesday as Jova approaches the coast. Jova's effects will include storm surge near and south of the landfall position, heavy rain and damaging winds. Power outages and flash flooding will also occur. 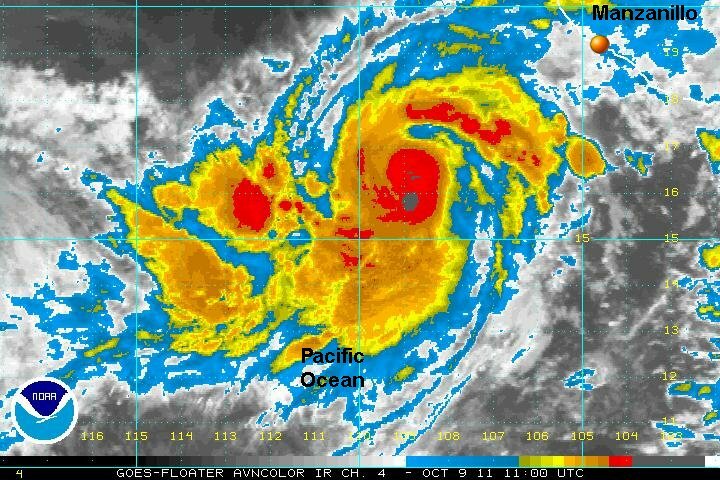 Jova has the potential of becoming a dangerous hurricane. As of 8 am edt / 5 am pdt Jova was centered near 16.1 N / 109.0 W or about 360 miles wsw of manzanillo, Mexico. Movement is east at about 6 mph. Top sustained winds are estimated at 80 mph (NHC 85 mph earlier advisory). Pressure 980 mb. Forecasts take Jova generally east today and tomorrow toward the coast of Mexico near Manzanillo. It should turn nne on Tuesday and make landfall Tuesday night possibly as a major hurricane. 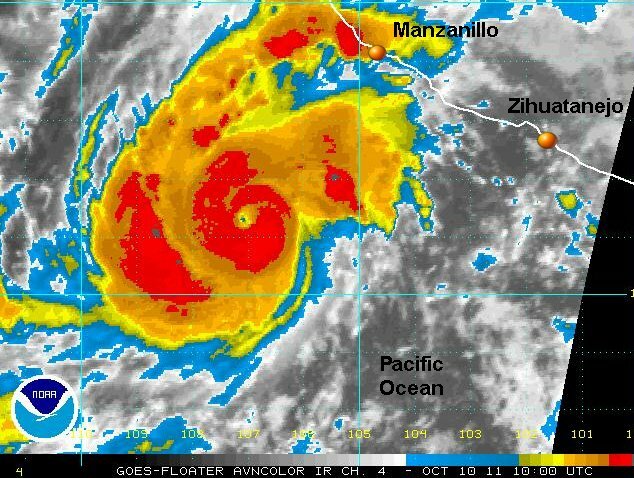 Residents and tourists near Manzanillo an adjacent communities should check traval plans and be prepared for possibly a major hurricane. Jova has gone through a strengthening phase overnight. The eyewall has expanded and the first heavy rainbands have made it over the coast. Additional outer rainbands will affect the coast today. Conditions will rapidly go downhill during the day Tuesday as Jova approaches the coast. The hurricane center's wind estimate of 120 mph looks reasonable. Jova's effects will include storm surge near and south of the landfall position, heavy rain and damaging winds. Power outages and flash flooding will also occur. Preparedness actions to save lives and property should be completed today. As of 7 am edt / 4 am pdt Jova was centered near 16.3 N / 107.1 W or about 255 miles sw of Manzanillo, Mexico. Movement is east at about 5 mph. Top sustained winds are estimated at 120 mph (NHC 120 mph earlier advisory). Pressure 960 mb. Forecasts take Jova generally east today and nne Tuesday toward the coast of Mexico near Manzanillo during the evening as a major hurricane. 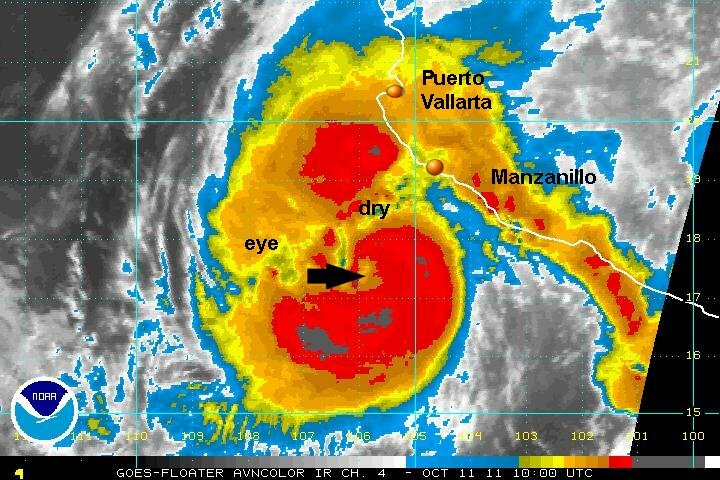 Residents and tourists near Manzanillo an adjacent communities should check traval plans and be prepared for a major hurricane. Jova may have strengthened a touch today. The eye is still embedded in the middle of the CDO (circular cloud mass). It is now moving northeast and may move more nne before making landfall late Tuesday..
As of 5 pm edt / 2 pm pdt Jova was centered near 16.8 N / 106.2 W or about 195 miles sw of Manzanillo, Mexico. Movement is northeast at about 7 mph. Top sustained winds are estimated at 125 mph (NHC 125 mph earlier advisory). Pressure 955 mb. Forecasts take Jova nne Tuesday toward the coast of Mexico near Manzanillo during the evening as a major hurricane. Jova entrained some dry air last night which weakened the circulation a touch. The eyewall is still very thick at it's possible that Jova could strengthen before landfall. The hurricane center has Jova making landfall as a cat 2 this evening. I am not ready to say that it will not come in as a cat 3 yet. Wind and heavy rain will become steady early this afternoon near Manzanillo. Jova's effects will include storm surge near and south of the landfall position, heavy rain and damaging winds. Power outages and flash flooding will also occur. Preparedness actions to save lives and property should have been completed already. 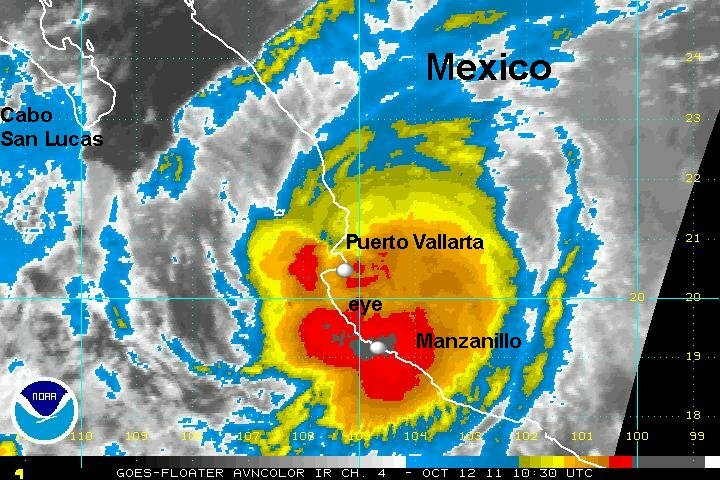 As of 7 am edt / 4 am pdt Jova was centered near 15.6 N / 105.9 W or about 185 miles sw of Manzanillo, Mexico. Movement is nne at about 6 mph. Top sustained winds are estimated at 115 mph (NHC 115 mph earlier advisory). Pressure 963 mb. Forecasts take Jova nne today toward the coast of Mexico near Manzanillo during the evening. Residents and tourists near Manzanillo an adjacent communities should be prepared for a category 2-3 hurricane. Jova is just off the coast of Mexico and will make landfall shortly. The eye had filled in as some of the inflow in now coming from land to the east. This has allowed Jova to weaken to a category 2 hurricane. The outer part of the eyewall is just coming ashore and the worst of the conditions will be this evening and overnight tonight. Jova's effects will include storm surge near and south of the landfall position, heavy rain and damaging winds. Power outages and flash flooding will also occur. 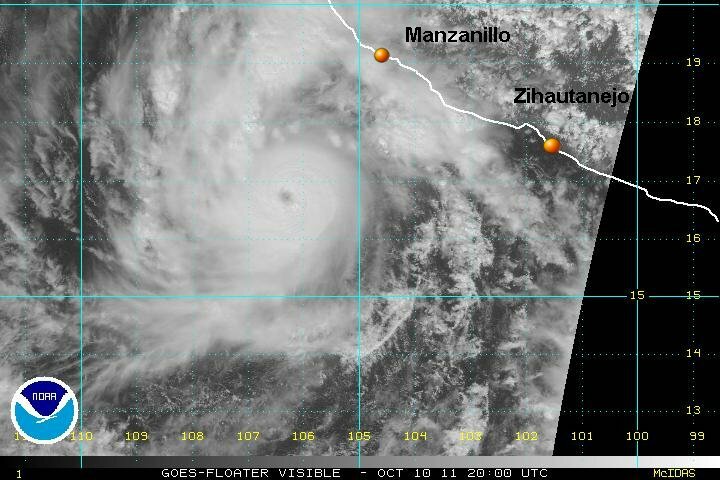 As of 7 pm edt / 4 pm pdt Jova was centered near 18.4 N / 105.4 W or about 70 miles sw of Manzanillo, Mexico. Movement is nne at about 6 mph. Top sustained winds are estimated at 100 mph (NHC 100 mph earlier advisory). Pressure 973 mb. Jova will move inland just north of Manzanillo this evenng and east of Puerto Vallarta as a weakening tropical storm Wednesday. Jova is inland and appears now to be moving a little east of due north. 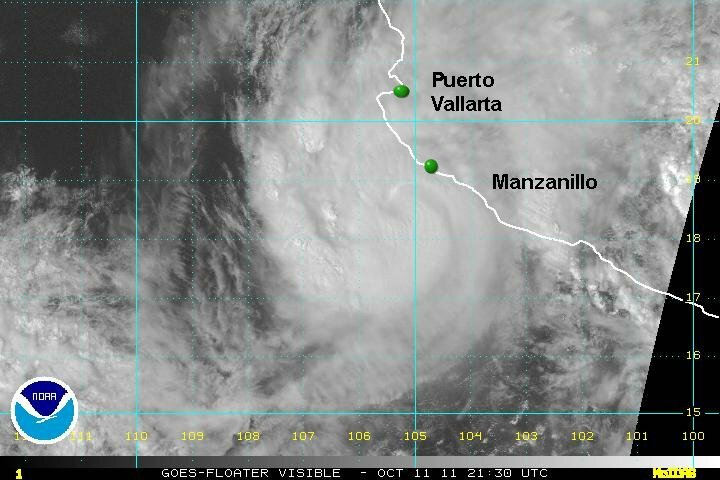 The strongest part of the eyewall is near Manzanillo and just offshore. Jova is producing damaging winds and storm surge and rainfall amounts can be expected to be over 10 inches where the eyewall remains stationary. Some rainfall totals will be near 20 inches. As of 7 am edt / 4 am pdt Jova was centered near 19.9 N / 104.9 W or about 50 miles se of Puerto Vallarta, Mexico / 95 miles nw of Manzanillo, Mexico. Movement is nne at about 6 mph. Top sustained winds are estimated at 85 mph (NHC 85 mph earlier advisory). Pressure 983 mb. Jova is inland and will slowly dissipate during the next 24 hours a little east of Puerto Vallarta. Jova is weakening east of Puerto Vallarta. Heavy rain is now the primary threat inland.